After an accidental day off yesterday due to being totally exhausted, week 5 began in earnest today. We had our last induction this morning – to the metalwork resources. My only experience of anything remotely resembling metalwork was in my second year undergrad electronics classes – the worst possible compulsory module a theoretical physicist could be forced to do. I still recall (with mild terror) being given a pile of resistors and a soldering iron and being expected to know what to do with them. Urg! This morning’s session was much more exciting and I think there are many things I will come back to look at. Metal is such an interesting material – malleable, flexible yet strong and unyielding. People think it is unnatural, but many metals are pure elements, and as such are just as organic as trees growing in a forest. From a certain perspective tree to plywood board has a similar transformation as that of ore to metal rod. And the plasma cutter! Very cool. After that, I thought it was time – 5 weeks in – to get making and begin experimenting on my newly clarified proposal area. My starting point, that of a mini-project around ghost candles is focussed around seeing what happens when a point light source is filtered through different materials. I had the pleasure of starting one of my new sketchbooks (bought with the gift vouchers given to me on leaving my railway job). Two artists have offered initial inspiration: first, Laura Kemshall, quilt artist extraordinaire. I was at her talk at Festival of Quilts 2014 on “digital quilts” over the summer and she had mentioned accidentally running out of thread on a quilt and not noticing. Due to the thick gold paint she was using on the fabric, the holes were permanent – but added an incredible and unexpected feature. Take a look at the quilt on her blog here. The other artist in my current spotlight is the work of Jane Blease who pierces and stitches wood veneer panels to make lamp shades and a range of other stuff. Love this effect. So where to start then? I am starting to work with paper first, using a variety of paper types and thicknesses, having had an expedition on the weekend to the fine paper store. 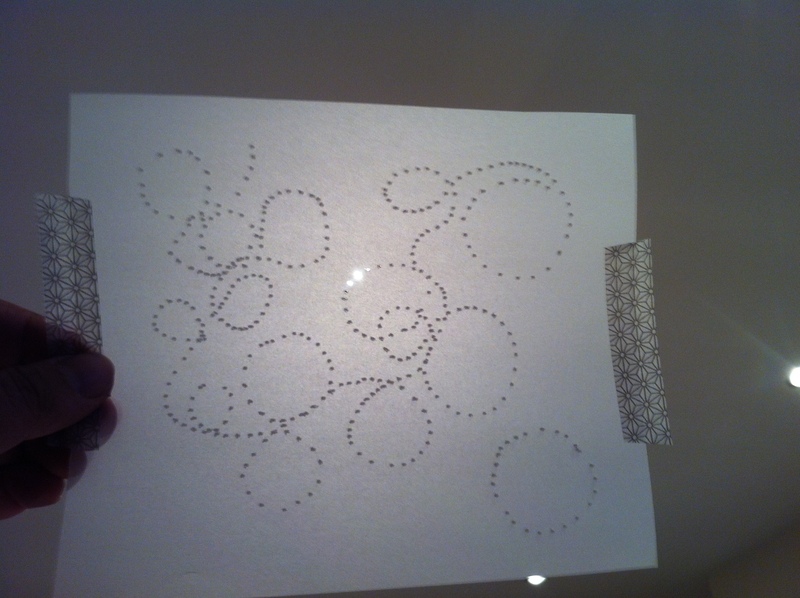 The first out of the roll was the tracing paper. I found a heavyweight tracing paper at 110gsm in my local art store, and put this to test in my Bernina with no thread (neither top thread nor bobbin). Pattern wise, I decided to start with two simple geometric symbols which mean a lot to me and my proposal: the circle, in its form as ensō; and the line, as the unending horizon. This was the result of my first samples for each pattern (held up to a ceiling light), and combining both patterns into a shade for a tea light. I like the effect of the clean holes through the material, and I really very much like working with the heavyweight paper. It will be interesting to see how the other papers I have change the effect. 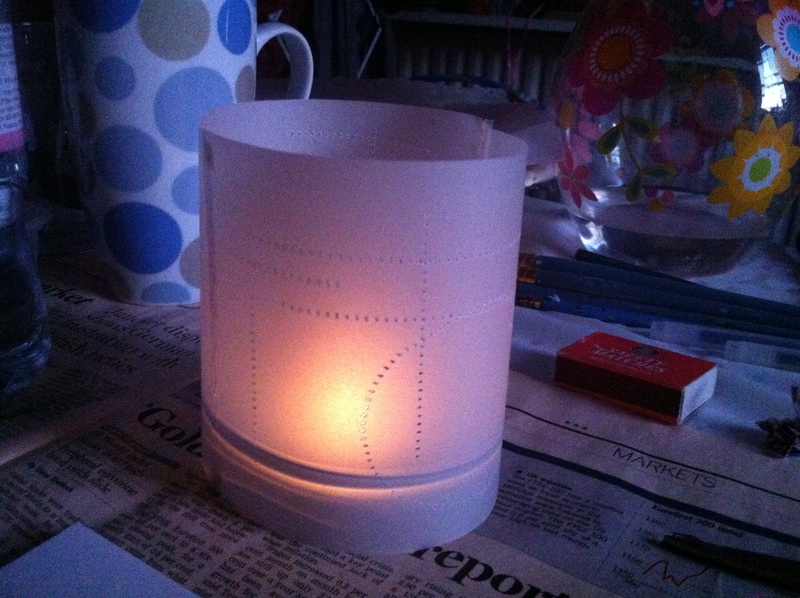 The filtering of the light is subtle, although a tea light isn’t the brightest of light sources. My set of fairy lights were so dim as to not to demonstrate much at all, so will get a brighter set. Considering I have already spotted Christmas stuff in the supermarket, this shouldn’t be too hard. You can’t see from the angle I took the photo, but the cylinder is made from two curves of paper stitched together with an unbleached cotton thread – I think putting the thread where it wouldn’t normally be and not where you would expect it to be is good, and something to continue on with. One of the most interesting features is the line of light and shadow which you see just above the top of the tea light. What is this from? Nice effect – must investigate. Good start! Tomorrow we start our getting making workshops with the lovely Bridget – very much looking forward to seeing what she has in store for us. Will share more tomorrow! This entry was posted in 03.5 Unit 1 experiments and tagged enso, Laura Kemshall, paper on 30 September,2014 by antalbot.